The Japan Aerospace Exploration Agency (JAXA) has been holding the "AKATSUKI Message Campaign" in order to enhance people's interest in Venus and to make people feel familiar with the Venus Climate Orbiter "AKATSUKI," which is scheduled to be launched by the H-IIA Launch Vehicle in Japan Fiscal Year 2010. We have been receiving many messages so far, and we would like to extend the deadline by two weeks for accepting more names and messages. The following is updated information on the campaign. Please send us a message during your New Year holidays. Along with messages sent by individuals via the Internet, we have been accepting messages from groups including schools and classes. Scientific museums are also putting together messages from people. We have also received messages from some famous people such as Astronaut Koichi Wakata and his Space Shuttle crew (STS-127, Commander Mark Polansky, Mission Specialists Astronaut David Wolf and Thomas Marshburn), singer Ayaka Hirahara, cartoonists Reiji Matsumoto and Chuya Koyama (serial cartoon "Ucyu-Kyodai," meaning Space Brothers, in the magazine "Morning" from Kodansha). You will be able to download a "certificate of participation to the campaign" when you send your name and/or message. It will be sent and shown only once, so if you want to keep it, please click the certificate to download it. * Only a name (without a message) is also acceptable. * You can send a message in Japanese characters (Hiragana, Kanji, and Katakana) as well as using numbers and/or Roman letters. However, some letters (such as half-sized Katakana) or some PC specific letters may not be properly encoded on our side. Please refrain from sending such letters. * The International Year of Astronomy 2009 Japan Committee will be in charge of accepting names and messages, counting them, and protecting your private information. * Your message may be used on our Web site, leaflet, and/or magazines for the purpose of public affairs and promotion. Copyright of the messages basically belong to JAXA. 2) Those who are a group with a dozen members or more in Japan (such as a school, kindergarten, company, residents' association, hobby club, science museum, or event organization team) can send a message via conventional postal mail. (A group with less than 10 members can also send a message.) Please write your message as large and clearly as possible within a limited paper size (A4). We also accept illustrations, but please remember that everything will be carved in black and white. Send your group name and a message on an A4 size paper (if your paper size is different, please make a contraction /enlargement copy to make it size A4) and write the following on the backside of the paper: the number of people in your group, the address, name, age, gender, telephone number, e-mail address of a representative of the group. (If no e-mail address is available, please send a postcard for a reply with your address and name and a 50-yen stamp on the front side). Send your message (and a reply postcard, if necessary) to the following address. * We will e-mail you (or send a reply postcard back in the case you send it to us) to let you know that we have received your message. * We will not send you back your message. Your message and illustration may be used on our Web site, leaflets, and/or magazines for the purpose of public affairs and promotion. (Please refrain from sending any information, messages and/or illustrations that you do not want us to publish, such as personal information.) Copyright of the messages and illustrations basically belong to JAXA. * Please be aware that messages will be scaled down by a large percentage when they are printed on an aluminum plate to be aboard the satellite. * JAXA (ISAS) will be in charge of accepting names and messages from groups, counting them, and protecting your private information. (Reference) Venus Climate Orbiter "AKATSUKI"
Venus is the brightest star, apart from the sun and moon, in the all-sky. It has been well-known among the Japanese as the "morning bright star" and "evening bright star" since ancient times. In the West, its shining beauty is explained in its name "Venus", the goddess of beauty. Venus comes closest to the Earth, and the two planets are often considered as "sister planets" as they were created in a similar process about 4.6 billion years ago. However, the environment of Venus is quite different from that of the Earth. It is believed that there are no oceans on Venus. As its atmosphere mostly consists of carbon dioxide, which causes the greenhouse effect, Venus has become a red heat planet with a temperature of 460 degrees. Although Venus has little rotation, sulfur clouds are floating around Venus with a velocity of 400 km from east to west. Outline of Venus Climate Orbiter "AKATSUKI"
The Venus Climate "AKATSUKI" (PLANET-C) is part of Japan's planet probe project following the Mars Orbiter "NOZOMI" (PLANET-B.) The AKATSUKI aims at elucidating the mystery of the Venus climate and atmosphere. 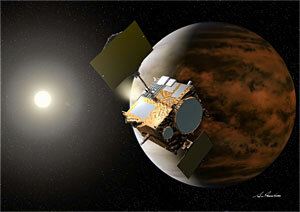 The orbiter will be launched in Japan Fiscal Year 2010 to arrive at the Venus orbit about six months after launch. It will then observe the Venus atmosphere for about two years. Expected achievements Venus is often called a "sister planet of the Earth." Although the two planets share some similarities such as the dimension and the distance from the Sun, the environment of Venus is completely different from that of the Earth as Venus is a red heat planet with sulfur clouds around it and surrounded by carbon dioxide. By studying this unique climate of Venus, we will be able to find some clues to clarify the birth of the Earth and its climate change. In other words, Venus climate exploration is one of the most important studies to understand the Earth's environment. The AKATSUKI is a pioneer in the era of Venus exploration. The AKATSUKI will be injected into the Venus elliptical orbit at an peri-Venus altitude of 300 km and apo-Venus altitude of 80,000 km. By utilizing the difference of distances from Venus, the AKATSUKI will observe the overall Venus meteorological phenomena and a broad area of the surface of Venus, and take close-up images of the atmosphere and clouds that run away from Venus to space. Also, on the surface of Venus, violent winds called a "super rotation," whose velocity reaches 100 meters per second, are observed. The super rotation, whose velocity is 60 times faster than the Venus rotation, is the biggest mystery of Venus as its cause cannot be explained meteorologically. The AKATSUKI aims at clarifying this mystery through infrared light observations of the Venus surface through its atmosphere and clouds. In addition, the mission will also study the electric discharge of lightening at Venus whose evidence has not been captured, and the existence of volcanic activities. We hope that Japan will play a pioneer role in the field of planet exploration through the activities of the AKATSUKI.